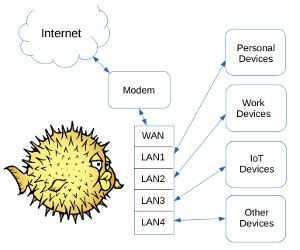 Build a secure, powerful, and reliable router using OpenBSD. You can create a secure and capable router by installing and configuring OpenBSD on some hardware that's suitable for the purpose. This guide explains how you can create an industrial-strength router+firewall appliance. OpenBSD is a superb operating system to choose for network routing and filtering. The OpenBSD project emphasizes standardization, correctness, and proactive security. OpenBSD's Packet Filter (PF) is powerful software that you can configure according to your preferences using a human-readable syntax. The instructions in this guide will create a router where two separated local networks (LANs) share a single Internet connection. The example device has three physical ethernet ports, however you can easily adapt the configuration to accomodate hardware with a different number of ports. Nearly every home or office should have at least two isolated LANs for security reasons. For example you can separate personal devices away from work devices or mitigate the risks of inherently-untrustworthy IoT devices by putting them on their own separate network. Baseline "horsepower" requirements are minimal if all you want to do is basic routing. Your main criteria should be stability and longevity of the device. Network adapters with an Intel chipset are recommended. Storage requirements are minimal as well. The basic OS installation is small -- well under a gigabyte, even if you install some extra packages. You can use any size hard drive or SSD, or even a flash drive. It would be wise to run your disk through a torture test, especially if it's a used disk. Two common open-source router hardware choices are the "Fanless Mini PC" and the retired enterprise desktop computer with a server-grade network adapter installed. Chinese manufacturers make small and silent Fanless Mini PC devices that consume very little power. They 're popular among the pfSense crowd. You can find a suitable model with four Intel-chipset gigabit network ports and a Celeron J1900 CPU for under $150. If you need AES cryptographic acceleration (e.g. 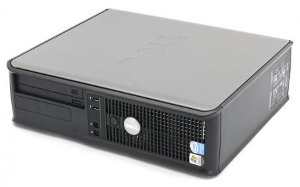 for VPN purposes) expect to spend about $250 for a more powerful model with a Celeron 3865U CPU or some similar processor with integrated AES instructions. You can build a superb router using an off-lease corporate desktop or workstation computer and a multi-port server network adapter from a retired corporate server. Enterprise gear is suitable because it's built to higher specifications than consumer gear. It will run 24/7 for years on end. You can find a suitable retired corporate desktop machine on eBay or elsewhere for well under $100. The router in this guide was made from a Dell OptiPlex GX620, a machine that's plenty fast and old enough not to have any "active management" features. Similar machines are available from HP and Lenovo. Your machine needs to have at least one standard PCI Express expansion slot. 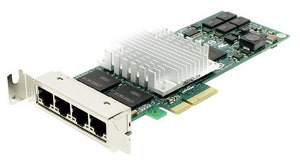 For network ports, use a multi-port server adapter that has an Intel chipset. You can find cards that are re-branded Intel Pro/1000 PT adapters sold by HP, Dell, Sun, IBM, and others. They're available for about $8 per port. Be sure your card has the correct bracket, either standard-height or low-profile. Install just the bare minimum OS because that's all a router needs. If your machine has an optical disk drive, burn a CD and install from that. Otherwise make a bootable thumb drive and use that for the installation. You may be surprised how easy OpenBSD is to install. Just choose (I)nstall and answer some questions. The example log's responses are from an installation that was onto a hard drive from a CD. Start out with some initial steps that you'd take with virtually any server. Log in using your username (not root) and check your mail. Hit Enter or Space to proceed and q when you're done. Next use root's password for the one and only time. Run syspatch to apply base system binary patches. The doas utility in OpenBSD is similar to sudo on other systems. It allows you to execute privileged commands without logging in as root or using root's password. Create a doas configuration file. For more security you can omit "persist". For less security you can change "persist" to "nopass". If you use nopass during setup you should switch it to persist when before deploying. Set permissions on the new configuration file. We no longer need to be logged in as root or use root's password. Restart the computer to ensure all of the patches are squared away. Next create an appropriate welcome screen. Match the group ownership of the original file. Change the Port from 22 to your alternative port number (e.g. 4222). The line that was #Port 22 becomes Port 4222 . A router doesn't need a sound daemon, so turn it off and set it not to run at startup. Skip ahead to the Firewall Configuration section if you configured the network interfaces during setup. 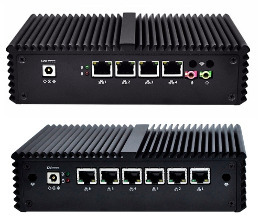 The example machine is a "multi-homed host" with three Intel-chipset physical network ports. One port (em0 in this example) will become the gateway and each of the other two (em1 and em2 in the example) will have its own isolated private network. Some lucky folks will just need to use DHCP for their WAN interface. If your external interface uses a static IP address, set the address, netmask, and gateway. Each LAN interface will have it's own RFC1918 private network address block. Our router+firewall will perform three basic functions: Routing and filtering (handled by pf), address assignment (handled by dhcpd), and domain name resolution (handled by unbound). Note: This would be a good time to log into your new machine using SSH (on the customized port, if you have one). That way you can use copy-and-paste rather than typing. Back up the original configuration file. Create a put our ruleset in a new configuration file. # Two private LANs share a WAN connection. Consider whether you really need to SSH into your firewall from the WAN side (probably not). If not, either delete the lines that pertain to SSH or comment-out the rules by inserting a # at the beginning of those five lines. Now that our custom firewall rules are in place we can enable packet forwarding. Create the configuration file that will start packet forwarding at startup. # This is a list of sysctl options the user wants set at boot time. # See sysctl(3) and sysctl(8) for more information. Now enable packet forwarding for this boot session. Set dhcpd to run at startup. # Use an upstream forwarder (recursive resolver) for specific zones. Have the daemon run at startup. You will probably want to make some changes to the configuration files, since they're just intended to be samples. Remove the exception from the <martians> list. If you don't need to SSH in from the Internet side, comment out the lines that are pertain to the SSH port. After you edit the file, run doas pfctl -f /etc/pf.conf to replace the current ruleset your edited rules. You can find plenty of information about OpenBSD and PF on the web. Take a look at Firewalling with OpenBSD's PF packet filter by Peter Hansteen. The content is similar to what's in his book, The Book of PF. SystemRescueCd provides a perfect environment for "burning in" your router's storage device before you install OpenBSD. Universal Plug and Play (UPnP) is not supported by OpenBSD, no doubt because of (in)security reasons. Generally speaking UPnP should be rigorously avoided and disabled on any router where it's present. It may be possible to make UPnP work using MiniUPnP. If you want to do DNS-based blocking of ads and trackers, consider using Pi-hole. Wondering about wireless? It's a good idea to keep your wireless access point (WAP) and firewall separate. Many wireless routers -- especially ones with third-party firmware -- can be re-configured as a WAP rather than a router. A wireless router can be left as a router (rather than a WAP) and it will work fine for Internet access. Your router has tcpdump installed by default. This is a powerful and useful feature all by itself. Remember to set your system so it powers back on automatically if electrical power is lost. On some machines it's wise to also enable a setting that ignores keyboard errors during startup. If this router is "replacing" an ISP-provided router, set the original router to Bridge Mode if that's possible. PF uses "macros" to ease administration. For example, something like "$lan1_if:network" is more meaningful than em1:network when you're looking at the configuration file. Using an alternative SSH port is not universally recommended. Using an alternative port that doesn't appear in the list of 1,000 ports that nmap scans by default will reduce noise in security logs. Tables, like macros, make administration easier by simplifying what is shown in the filtering rules. The Martians table includes a whitelisted network (!192.168.24.0/24) you should probably remove, along with its comment. After the NAT rule are some rules that are pretty much universal in a firewall ruleset. The LAN-to-LAN rules prohibit traffic among the LANs. You can add whitelist rules that, for example, allow devices on one LAN to reach a printer on another. The rule that allows ping and path MTU discovery is recommended unless you have a specific reason not to allow those.